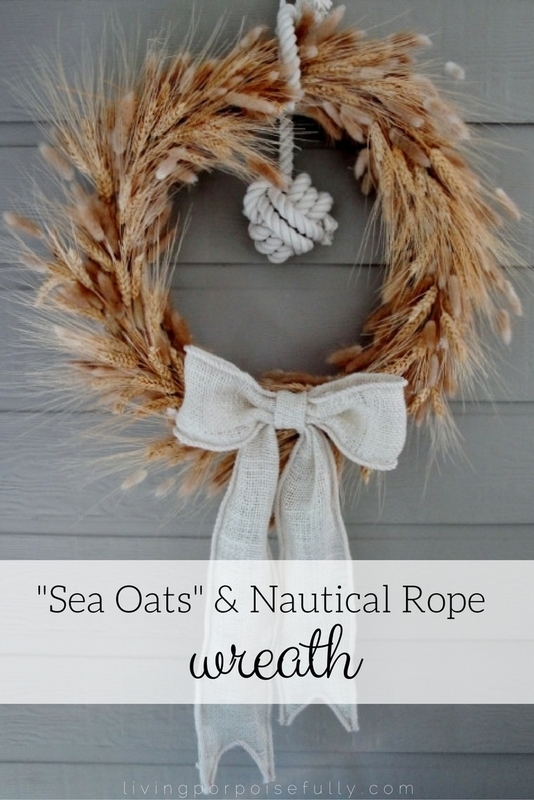 This “sea oats” (wheat) and nautical rope wreath will make you think you can hear the sea oats rustling in the breeze. Perfect for a coastal fall! Ahhh the feeling of fall! The newly crisp air seems to lighten each step and give a sense of childlike wonder for the beauty of the changing seasons. Whether the scenery around you changes significantly for you or not, I think fall reminds us of the cycles and seasons that are simply a part of this beautiful dance called life. Taking this reminder to heart, I thought it would be a great time to enjoy the fall season with a wreath that makes me feel “fall-ish”! I know fall leaves of course are the classic go-to, but I love the way sea oats look swaying in the breeze, and it makes me think of walking through cool sand on a fall evening. So why not make a wreath to hang on our door that would evoke this feeling? Of course, sea oats are often protected by law and off-limits to beachgoers, for good reason: their root systems actually help anchor the sand in place, helping to prevent beach erosion. If we walk on them, we’d destroy this natural protection and the beach would be lost to the sea much more quickly. So instead of using real sea oats, I used natural wheat bunches and dried Lagurus bunches from the craft store. In my search of a how-to guide, I came across this wheat wreath tutorial from On Sutton Place. Ann made a stunning yet simplistic wreath with a straw wreath, natural wheat bunches and a beautiful burlap bow. So, I wholeheartedly embarked on the adventure, following her tutorial as a guide (thanks, Ann!). To give it another touch of the sea, I made a natural cream burlap ribbon bow with a rope trim. To top it all off, a cream rope tied in the form of a monkey’s fist knot gave it the oh-so-soothing nautical touch I was looking for. I searched for instructions, got way confused, then started to play with it and found out I didn’t have enough rope to finish it completely! So what you see here isn’t quite a true monkey’s fist knot, but it was good enough in my opinion. I used smaller rope to wrap around the wreath as a hanger (same rope as the trim on the ribbon), and the “sea oats” wreath was complete! Whether you call it sea oats or wheat, I think the result is just right for a coastal fall and brings me back to the memory of cool sand and swaying sea oats on a coastal fall day. Did you hear sea oats rustling through the breeze while reading this? I hope so and that it keeps the coast just a little closer for you!